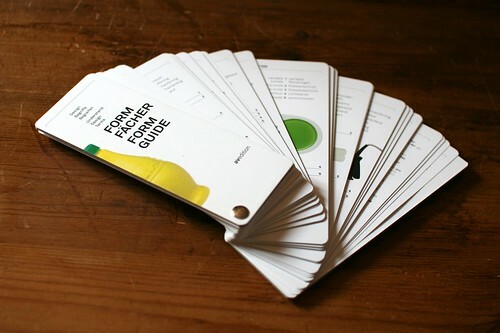 "The "formguide" explores the potential of language for the description of objects and forms. Using examples, a professional terminology is developed which aids communication about design in practice and education. The versatile vocabulary can be used to describe design solutions more precisely. 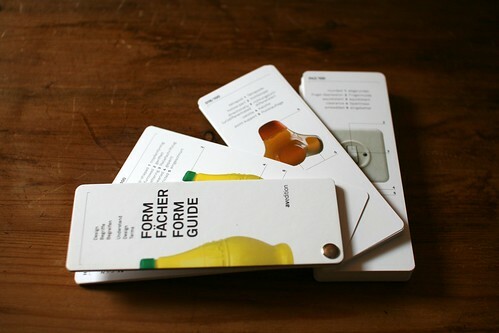 Hundred products were selected for this purpose and are presented with photography and a brief description of their origin, making the form guide a helpful and informative tool for everyday use." This publication for designers is the result of a collaborative research project between the Industrial Design Department of the Zurich University of the Arts, the Design collection of the Museum of Design Zurich and the Idea Institute of the Burg Giebichenstein, University of Art and Design Halle, Germany. Why do I blog this? I quickly became intrigued by this tool because of our current project with Laurent Bolli concerning the classification of video game controllers. What's interesting with this form guide is simply the terminology proposed in there and the way it can be used to sort different artifacts.